Season the quails with salt, and pepper. 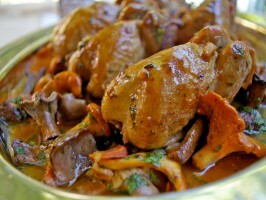 Melt half the butter with a drop of oil in a heavy casserole, and brown the quails on all sides over medium-high heat. Cook’s Note: you could also use lard. Remove the quail from the pan, and set aside. Add the bacon to the pan, brown it, and remove. Finally, fry the onion until golden, adding more fat to the pan beforehand, if needed. Stir the flour into the onions, and cook 1 minute. Deglaze the pan with the wine, stirring up the good bits on the bottom of the pan with a wooden spoon. Return the onions, bacon and quails to the pot. Pour over the stock, cover, and simmer until the quails are just cooked through, about 20 minutes. Meanwhile, heat the remaining butter (a little more if you like) and cook each type of mushroom separate, as the various types cook differently. Season the mushrooms with salt and pepper as you go, then, at the end, toss them all together with the chopped parsley. When the quails are done, remove them from the cooking liquid and keep them warm while you boil the juices, uncovered, to reduce to thin sauce consistency. Add the mushrooms to the sauce. Tilt into a serving dish, set the quails on top, and serve.